Is geared for those ages 7 - 11. This class focuses on advanced training techniques, and a broad curriculum to continually challenge students and develop strong mental and physical skills. These students are encouraged to try their best at challenging techniques, to think quickly and make smart decisions. A popular program at our dojang as parents enjoy the challenges their children face and overcome. Positive reinforcement and encouragement to excel at all tasks help make these children strong and capable children. The training is active, sweaty and fun! An excellent class to be a part of, the students are challenged by the instructors to think critically and overcome obstacles. This class is high energy and fast paced as the students at this level appreciate a challenging class. Students in the Dragon's Advanced excel in life challenges and do well in all aspects of life. 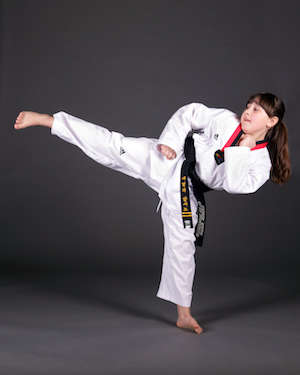 The class is physically demanding and great for children who set goals and work to achieve them!